I drove from Brussels to see Yes in Utrecht. My first "Yes" concert was in fact ABWH, in Brussels, November 1989. I was 18. It was the first time I had the chance to see Jon, Steve, Bill, Rick and Tony (don't forget Tony Levin is a great musician too) on stage (I saw Bill and Tony with King Crimson twice, since then). 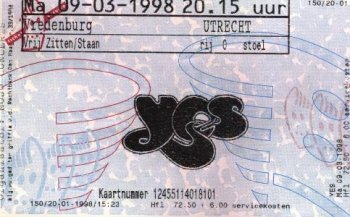 Two years later, I went to the Yes "Union" concert in Brussels (June 22nd, 1991). There, I had the great privilege to see my favourite musician of all times, Mister Christopher Squire himself! He impressed me very much, and I had to wait 7 long years to see him again. This Monday March 9th, 1998, we arrived in Utrecht at noon. I was with my lovely wife, my brother and his girlfriend. We spent the cold and sunny afternoon visiting the city. At 6 p.m., there were already a few dozen people waiting at the doors of the Vredenburg's "grote zaal". The doors opened at 7 p.m., and we were in the 20 first people to enter. We rushed to be on the first raw, standing, just putting our coats on the stage! We were just in front of Chris Squire's microphone! I became more and more excited, waiting impatiently for the first notes of "Firebird Suite". At 8.15 p.m. exactly (as written on the ticket), the magnificent opening began. The musicians slowly took place in the dark. And then, they appeared in the light and began to play a furious version of "Siberian Khatru". Just perfect: powerful and very inspired at the same time. The guys were enjoying themselves, especially Chris Squire. As we were just in front of him and his amp, his bass lines just flew through us with a deep and thrilling sound! Steve Howe's solo, during the final part, was far more inspired than the "Keys To Ascension" version. His enthusiasm was evident. And Jon's voice, well... simply beautiful! Then, they played "Rhythm Of Love". Not a really good version, although I think it is a really good song. The crowd's response wasn't so warm this time. But the inspiration came back with "America". I always loved this song, I mean the Yes version. This is a great example of Yes music, even if it's a Paul Simon song. Yes kept the lyrics and some vocal melodies from the original, but they completely re-arranged the music and developed the song into a great musical journey. In that song, every note Steve plays is unique. Every bass line, every guitar riff, every drum beat, everything falls into place so evidently, despite the high complexity. Since the "Keys To Ascension" release, I preferred the live version. The only thing I found sad, with the 1996 version, was the "new" ending. Here, in Utrecht, they restored the original ending, with the suspended note, and they played the song perfectly! Nothing to add! Simply the best version I've ever heard! Squire missed one bass note!